My daughter’s friend asked me to make her a birthday cake for her 18th birthday. 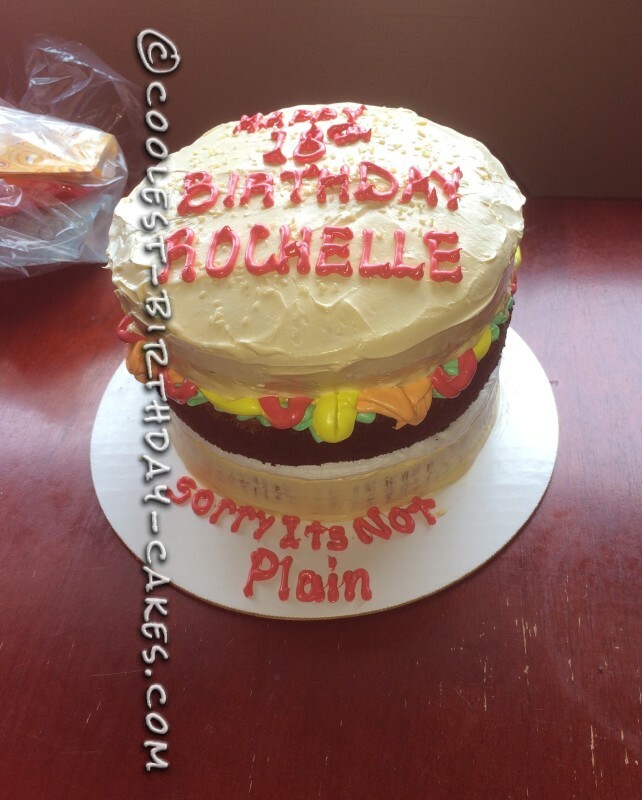 I asked her what she wanted and she said to make something random so I looked online and saw a cheeseburger cake and thought it would be funny because she is very fussy and doesn’t eat anything. She really doesn’t like anything that you put on a burger so I made sure it was loaded! At her party everyone had a good laugh! It was fun to make and great to see people’s reactions to such a strange Idea for an 18th birthday! The cake was made using 1 round chocolate cake and 2 round white cakes. I used chocolate icing on the chocolate cake and patted it with Oreo cookie crumbs to make it look like a patty. 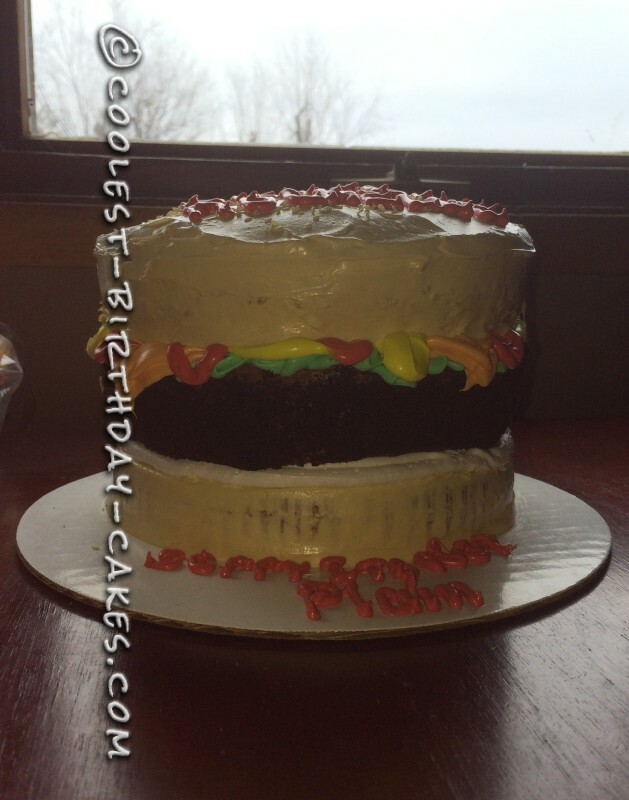 I used a beige color icing to cover the 2 white cakes and once I put the patty on the bottom layer I added green for lettuce, orange for cheese, yellow for mustard, red for ketchup before putting the top bun on. I then sprinkled on some sesame seeds and finished it off with the writting. The top bun could have been shaped a bit better so it was more rounded but I’m not really a pro or anything so I just did what I could. The best part of the whole thing was seeing the birthday girls smile when I brought her the cake. She really didn’t seem to want to share it with anyone but she did in the end. I have had many people asking me to make cakes since then so it has been great to try a bunch of new things and it is so much fun to mess around in the kitchen and create new and unique cakes for all my family’s birthdays! Can’t hardly wait for the next one! !